44 • FOODSERVICE EQUIPMENT & SUPPLIES • JANUARY 2018 In other words, the front of the house makes the money, but if the back of the house isn't efficient enough to support the guest experience, the con- cept won't be successful. "You have to be part psychologist, part psychiatrist," Egnor says. "Through the process, you develop an understand- ing with the client. Hopefully, you are doing the right thing and helping them massage their expectations." MENU DRIVES EVERYTHING Once an operator has the one-sentence concept, the menu becomes the most important tool. Each of the design con- sultants agree that the menu dictates everything that happens in the kitchen. 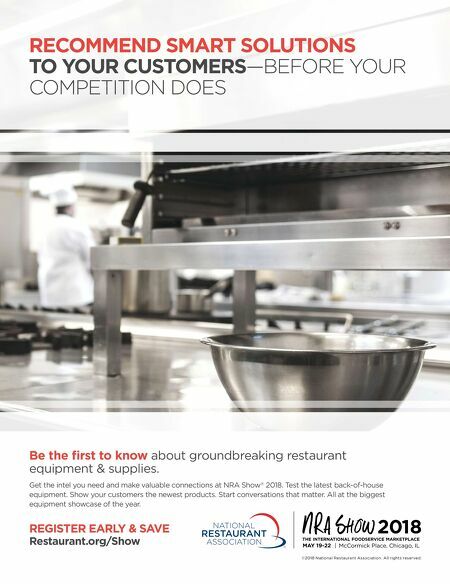 The foodservice operator must test and approve each menu item to evaluate the staff's ability to execute the culinary vision on equipment that will fit within the space. For instance, Richards says his firm just completed a small deli located in a c-store. To conserve space, he recom- mended the client stick to a handful of core ingredients, focusing on top- selling items. He also suggested looking at alternate ways to prepare some of the items. This reduced the footprint of the equipment required. In addition, the kitchen and serving areas were designed to be flexible enough so the client could adjust the menu later if needed. Figure out how many covers you will do in a day and run the hours on a spreadsheet, Egnor advises. "Your kitchen needs to be able to handle your highest volume at peak time." FRONT-OF-THE-HOUSE ISSUES Traditional allocation of space for kitchen versus dining area doesn't auto- matically translate to a smaller space. In a larger restaurant, the space allocation might be 60:40, dining area to kitchen. In a smaller space, it may be more like 70:30 or even 75:25. "Unless you have a chef's table, you can't sell the kitchen," says Salvatore. "The front of the house is where you make your money, so you need to start there to understand what you have left over for the back. You have to match the kitchen to the demands of the front." The nature of the concept drives design. With takeout concepts, for example, the space ratio will tip in favor of the kitchen. If guests will eat on premise, though, every inch of space must be designed wisely. Questions to ask: Will customers pick up their food or receive it tableside? Will they get their own beverages? Will the kitchen open to the dining area? Will guests see their food being prepared? If the operation includes seating, the designers recommend mixing up the variety, not just from an experience standpoint but from a visual standpoint as well. They often put in a community table. Banquettes are also a space-sav- ing solution since they can have a row of flexible two-tops in front. Nowadays, people aren't afraid of sitting next to each other. "People like the activity. They like seeing people. It's that kind of vibe we are designing around," Corey-Ferrini says. It is also important to plan for single diners. A counter space with stools along the front window is ideal. This accommodates individuals rather than having them take up a two-top. Service stations are a thing of the past in most small spaces. There is an exception, though, says Kuczera. If a fast-casual restaurant caters to a certain demographic that carries refillable water bottles with them, it may want a water station so guests can refill their own bottles. This requires plumbing in the front of the house. EQUIPMENT DECISIONS SUPPORT THE MENU Today's foodservice operations can survive and thrive in smaller spaces thanks in part to innovation in equip- ment design. Smaller kitchens still use the same types of equipment as their larger counterparts: refrigeration, prep, cooking, ventilation, warewashing and storage. Fitting all of these items into a tight space represents the key chal- lenge. Here are considerations design- ers recommend for each category. Refrigeration. Kuczera looks at refrigeration first. She investigates the possibility of going high. "Having space for a nine-foot-high walk-in cooler is big," Kuczera says. She also looks for the ability to add a shelf in a cooler. "If it's designed for four but we can get five in, we've got 25 percent more capacity," she points out. Kuczera also highly recommends in- cluding a blast chiller to extend the life of food products. "It's a food safety compo- nent but also a food quality component to our way of thinking," she says. Corey-Ferrini says it may be best to have a walk-in at the back of the kitchen, along with a couple of reach-ins. 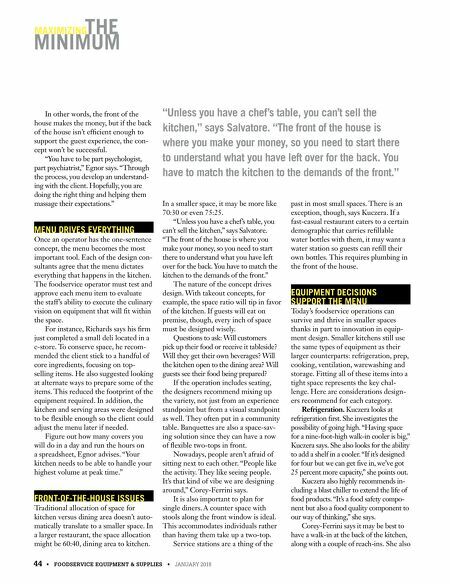 She also MINIMUM MAXIMIZING THE "Unless you have a chef's table, you can't sell the kitchen," says Salvatore. "The front of the house is where you make your money, so you need to start there to understand what you have left over for the back. You have to match the kitchen to the demands of the front."